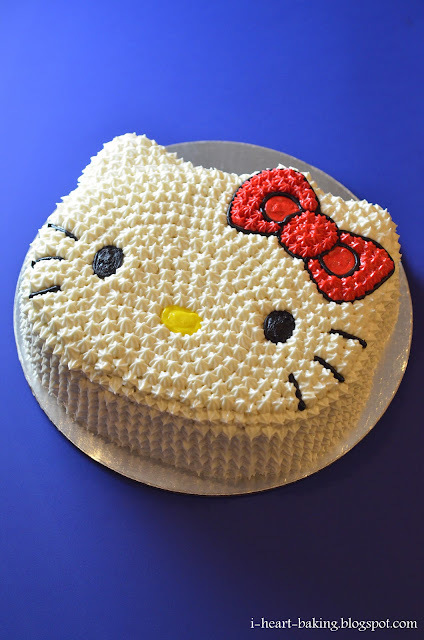 My friend Helen has a friend Alysa who asked me to make a Hello Kitty cake for a bridal shower she was planning. I had made the same cake for my daughter's first birthday, as well as a piggy cake using the same cake pan. This time I made two layers of chocolate cake, and a strawberry whipped cream to go in between to two layers. I've made whipped cream filling to go inside of chiffon cake in the past, but never for a more dense cake like this chocolate cake. I had seen a recipe somewhere for stabilized whipped cream, which had dissolved gelatin added to it, so I thought I would try that to keep the whipped cream firm. But when I tried it out, the whipped cream came out soft and gummy - perhaps I added the dissolved gelatin too soon? So I ended up making a second batch of my regular strawberry whipped cream - hopefully it held up! After filling and stacking the two layers, I did a crumb coat of cream cheese frosting. Then I piped the eyes, nose, bow, and whiskers. And finally I filled in the entire face with a star tip. When Alysa came to pick up the cake, we both thought each other looked familiar - and after talking a bit, it turned out that we went to the same high school! What a small world! You can now find my recipe for Hello Kitty Shaped Cake in my new book, "The Hello Kitty Baking Book"! Enjoy! Complimenti, son qui davanti al pc con mia figlia di 4 anni ad ammirarla! This is such a cute cake for a girls birthday! What a darling cake! You do such exquisite work!!! I found the link for your site on del-icio.us! 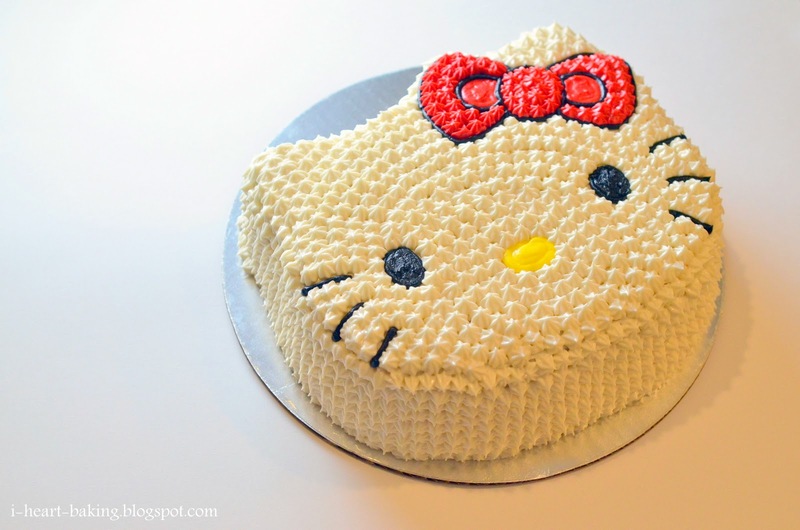 These are really great cakes, especially the Hello Kitty designs! The step-by-step pictures are really neat and add so much to the articles/blogs. They look really...Yummy. The photo showing the expression of excitement and joy at first sight of the Superman cake at the birthday part WAS priceless. All best! I've spent the last 20 minutes on here in awe of these Hello Kitty goodies! 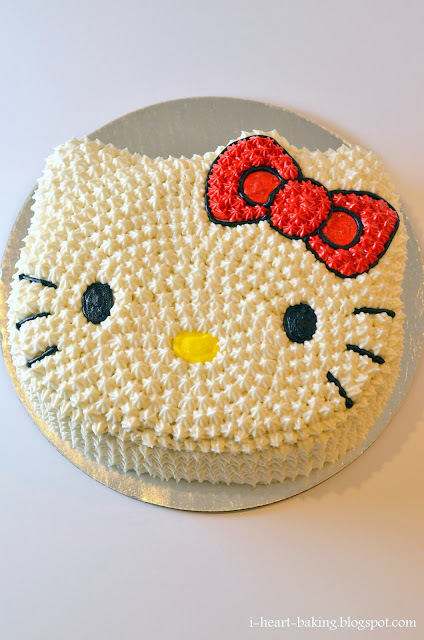 Awesome hello kitty cake ..You have a beautiful blog ..I'm planning to have a party for my three year old .Can You tell how much batter do I need to make a cake using this pan ..Thanks ..
Hi! I found your site on Pinterest and am making one of these cakes this week. I see the commenter above me asking the same question...but I am not a cake baker, just make them occasionally for my kids. So should I buy 2 boxes of mix for 2 layers of this cake or will one store-bought box give me enough to bake two layers? @Amanda - i believe one box of mix will make two 8-inch layers, correct? it should say on the box. if so, then you can just use one box. the recipe i use is not a box mix, but it is meant to fill two 8-inch pans. good luck!